Here we are going to encourage others to buy the rose that stole our heart last year! Along with naming others we own. Post your pictures of your roses here. If you think you know the sure name of it. Keeping in mind there is a downloading copyright law or two that does protect the owner of the picture. Credit needs to be given if it is not your picture, actually it doesn't belong here if it is not your picture of your rose, which is what this thread is for, sharing your pics of your roses! Kale's right, please respect copyright laws. That's one area I'm rather picky about, between the threat of copyright lawsuits and being a photographer, I'm definitely quite sensitive to that topic. I will clarify one thing. It has to be your photo, but it doesn't have to be your rose. You can take a photo of a rose in the park or a display garden or even at a greenhouse and post it here. As long as you've taken the photo, you're obeying copyrights. So what if you've found a picture of the perfect rose online, and you simply have to share it with the rest of us? Just post the picture, nobody will know... (I'm kidding!) What you can do is simply post a link to the photo. That's perfectly OK, and doesn't violate copyright. 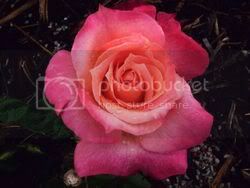 Simply say "Hey take a look at this wonderful rose, here's a link" and then include the link. That way you can still share the photo while I can avoid sharing my bank account with a copyright lawyer. O.K., I thought of that link posting idea, but was pressed for time,(was writing for several hours) besides, we were to see each others roses. Trying to keep the train of thought focused. "Roses that stole our heart as well as others we own"
The pic link would work if you don’t have a camera or can't post a pic. Let's say I took a pic of a rose at the zoo and I think I need it for my collection I didn't know it's name, I would then post it there ( in"What is this rose" thread), then come early spring I buy it if it was identified! And if I took one at the zoo I just simply wanted to share, it would go into the "tour" thread or "Lets see your rose pics and place you took them) Of course the name doesnt have to be that long but that is the ideas I had. If you are going to come to lower MI I would then send you to a Wonderful Rose Garden that I know of along with the zoo and Greenfield village I have pics of all .All you would have to do is go to that thread and see no need for Look ups.It would be places that someone actually went to and enjoyed thus causing one to do the same. I'm thinking train of thought, it is no fun trying to find something that isnt in the correct place,I know we will fall off topics ,no way to avoid that when conversing,it would just make searching a little more pleasant and less stressful for everyone...that's my thought. Isn't she beautiful! Do you know the breeder!?? Are you zone5? Does she have a sweet soft fragrance? How do you see DD? Did you click on the link above that I posted? i have 1 left i think. between the deer, cold and japanese beetles, they have died. Yes, it is Blue Girl, I also have Blue Nile! Which blooms more at a time. I have JFK which is mildly scented as of his first year.May have to move him to more sun, and didn't know how tall he was going to grow. I'm guessing about 4'. He is the main rose that had Japanese Beetle this year,I understand the light colored ones attract them. He was still lovely.Starts out yellowish and turns white with time about 4 days or so. blooms about 4 or 5 at a time not in clusters. I cant believe how much Double Delight has delighted me I only bought it because it had the two colors to tie my new row of roses together I put him/her between Climbing Tropicana and Josephs Coat and across from Angel Face and Newday. I sorta bought over 30 roses in '08.some I had in the past and my darling neighbor killed(on purpose because it made her feel important to herself) some I drowned in a pot with holes that were too small for drainage years ago and some I had names/breeds) I already have and loved and wanted to see if they were the same.Some Im totally new to. All almost all are glorious to work with. Mainegal, It is very hard I hear when deer are involved. Can't you put them in a cage/ fencing during deer eating season or do they attack all year? Fox urine is suppose to help. Maybe dry blood meal? Something has to keep them away ..no??? you can grow minis in a large container/pot! If you want roses we will try real hard to find a way to keep those deer away! Kale, please, please - what is image #9???? IMG 4268 in your link??? I know I'm going to have to try DD, but I like that one too! Kale your roses are beautiful.. I have a few that are special mostly mini's but the tea's are hard to beat.. I now have a few inside *LOL trying to nurse them .They were suppose top be Cold Hardy-20 but they sure didnt act like it. Are they suppose to shed then grow all foliage back?I think I'm missing something.I have not read anything like what happens to mine. The reds do bloom but they do loose leaves and come back full force after weeks pass. I am so sorry I didn't see your post. That my dear is PINATA! I see it in my edit mode 2xs..strange..
All are Pinata (climber to 12 feet) suppose to look like Josephs Coat,I do not know how true as of yet. Joseph is still a baby and he was in bad shape when I bought him so his blooms last year were pretty but not strong and solid. my Pinata (s)are from 2006 and 2008 none grew over 3ft. Again,I'm sorry, don't know how I didn't see your post. I grow a lot of roses. I have this years photos on the link below. Some photos look similar since I have not gone through and figured out which ones I like the best. I viewed your pics..very nice.Some gorgeous! I'm mostly a Hybrid Tea grower,although I grow several others, by heart is steady on the teas.I enjoyed your pics.Thanks for sharing! Oh my, Remy!! Your yard must smell heavenly. Where are you from New York,,,,maybe I could swing by your yard for a big sniff also.....truely lovely....great job!! You guys are killing me!! Sitting here in withdraw sniffing a vintage rose scented candle. I do love all roses. I have a few hybrid teas. Unfortunately, they don't do that well here. Plus I don't spray my roses, so that makes it even more difficult to grow them well. I've found Buck roses to be a good substitute. They look very hybrid tea like, but do much better here. Thanks! It does smell great in June. I love coming home from work, getting out of the car, and sniffing the air, lol. I live between Buffalo and Niagara Falls. You are always welcome to stop by any June through early July I have an odd problem of people stopping by in the middle of August when things look their worst! Plus not many roses are blooming then. HUmmm, The plants you grow would not grow here,I doubt it .And my roses do best in August I had 28 Rose plants or more full bloom,probably over 100 blooms that week mostly teas a few Grandifloria and Floribundas Polyanthas are almost always in bloom.Hey what are you saying! Aren't those rose blooms your in your photobucket!? They are stunningly gorgeous! Yes Hybrids are a challenge I know of several rose bushes I tend that are like sweet little children (just bloom their hearts out with little care) Hybrid Teas on the other hand are temperamental brats but ..I live for their breathtaking blooms*LOL You grow wonderful roses!! !A rose is a Rose and you do excellently with roses! I I do not think I have never grown or seen a Buck Rose up close. What makes then different then others? I am guessing some are sweet scented..I just thought you had climbers which I am new at,but they are Hybrid Tea climbers.